Do you know what country grew the tallest sunflower? The Netherlands (25' 5.5" tall) grown in 1986 by M. Heijmf. 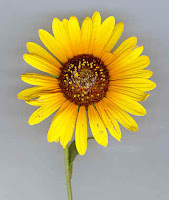 Wild sunflower is highly branched with small heads and small seeds, in contrast to the single-stem and large seed head of domesticated sunflower. Sunflower plants can be from 3 to 18 feet tall. Oil is made from black seeds. Sunflowers are very beautiful flowers and are used for decoration.Sunflower plants can be from 3 to 18 feet tall. One sunflower can have up to 2000 seeds. Sunflowers are also an important crop. There are more than sixty different kinds of sunflowers growing in the United States, Europe, Japan and Russia. Sunflowers originally came from the United States. Beautiful picture and a really lovely post... very interesting indeed... keep up the good show. VERY INTERESTING FACTS! I BELEIVE THAT THE TALLEST SUNFLOWER IN THE WORLD (ACCORDING TO THE GUINESS WORLD RECORD) IS IN GERMANY, WITH A HEIGHT OF 8.03M (26FT 4 IN), OWNED BY HANS-PETER SCHIFFER! I think that was before they found the one in Germany! Any way there are really cool and interesting facts. Awesome site if you want to do research on Sunflowers. Awesome information! Helped a lot did you know that sunflowers always face north? Awesome facts! Helped heaps. Did you know that sunflowers always face north? Awesome information! Helped heaps. Did you know that sunflowers always face north? thanks for the great facts! Sunflowers don't always face north. I have a row of sunflowers that are very tall, about 11' tall. The flowers are very large and do follow the sun which is neat to watch but the flowers always face south. Actually, Sunflowers "track" the sun in their infant stages when buds are young. In their adult stage they will permanently face east. Did you know that? Wonderful facts. Have a glance at this blog Interesting Facts and say your opinion. nice information, I think it was rightly said that sunflower in thier adult stage permanantly face east. Nice facts, It is rightly said that sunflower in their adult stage thay will permanently face east. Good facts helped with me a lot on my research paper did you also know that the new tallest flower is in Russia now? it is about 30 meters tall. Thanks for the info. still. On my homework fair, it was very hard to think of my own facts... but with these interesting facts, i can think of anything!!!!!!!!!!!!!! Ukraine's national flower is sunflower. Russia's national flower is chamomile.